Most of the restrictions implemented in Feb 2019 remain in place, effective through to 15 MAY at the earliest. For flights to airports in Pakistan, there are specific routes you have to use – check here for the full list. 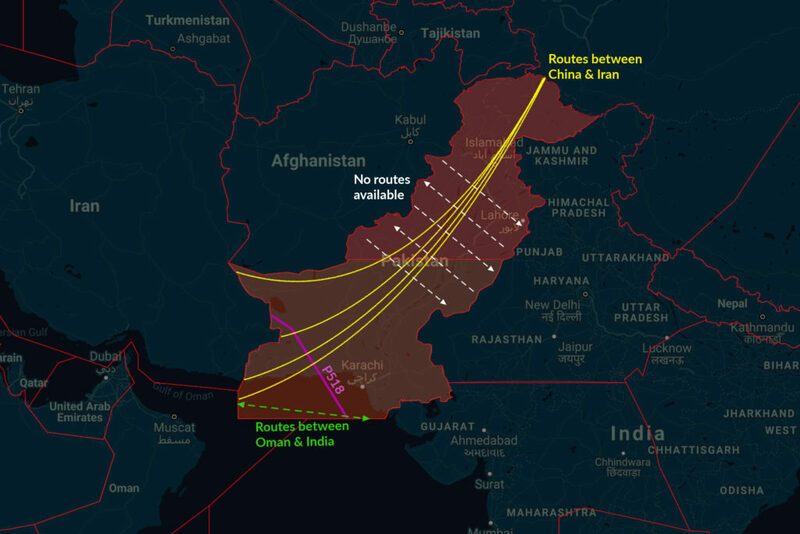 For overflights, there are a number of routes available connecting China and Iran, and a few which connect Oman and India through Pakistan’s airspace over the Gulf of Oman. But there’s only one route available for flights connecting India and Iran – airway P518. Multiple airlines have started using P518 for flights to Europe, particularly from VIDP/Delhi and VABB/Mumbai. Although the Pakistan Notams do state that all the same waypoints from airway P518 are available for southbound traffic too, airlines only seem to be using this routing for northbound flights – exiting the VABF/Mumbai FIR, transiting Pakistan’s airspace, and heading on into Iran’s OIIX/Tehran FIR and beyond. 6) EGRON/METBI JI LAKIV DCT SAPNA. 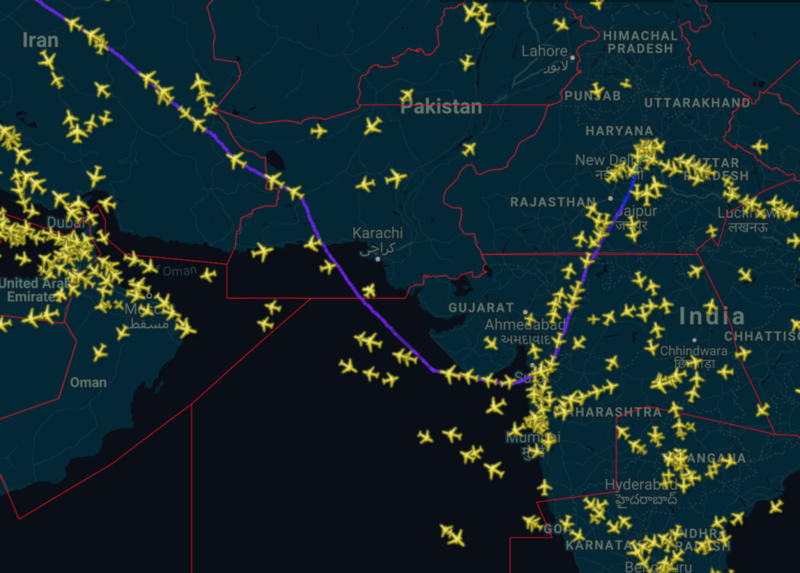 India and Oman remain congested with a lot of flights re-routing around Pakistan airspace. Both countries have published Notams showing all the restrictions on the various different overflight routes, are advising operators to carry extra fuel, and to expect lower flights levels than requested. India is advising that flights to Europe from all southern Indian airports can use oceanic airway N571. FLIGHTS FM THE ABOVE AIRPORTS WITH DEST IN EUROPE MAY FLT PLAN VIA N571. SUCH FLIGHTS MAY BE SUBJECT TO DLA ON GND TO COMPLY WITH FLT LVL RESTRICTIONS. FLIGHTS UNDER EXTENDED DIVERSION TIME OPS RESTRICTIONS MAY EXP ALTN ATS RTE AT SUB OPTIMAL FLT LEVELS. 3-VOCL/VOCI/VOTV/VOCB/VOKN/VOTR/VOMD VIA M300 LOTAV P570 KITAL N318 REXOD THEN N563. 4-VOML VIA N318 REXOD N563 OR M300 LOTAV. FLIGHTS UNDER EXTENDED DIVERSION TIME OPS RESTRICTIONS (EDTO) MAY EXP ALTN ATS RTE AT SUB OPTIMAL FLT LEVELS. 1. 30NM SEPARATION IS APPLIED BETWEEN ALL UAE DEPARTURES TRANSITING MUSCAT FIR TO TEHRAN OR MUMBAI FIRS OR PAKISTAN AIRSPACE. 2. 50NM SEPARATION IS APPLIED TO TFC AT SAME FLIGHT LEVEL ENTERING MUSCAT FIR AT MESPO. 3. ALL TFC TRANSITING MUSCAT FIR MAY EXPECT TACTICAL RE-ROUTING AND/OR ALLOCATION OF NON-ECONOMICAL FLIGHT LEVELS. AIRLINES ARE ADVISED TO CARRY APPROPRIATE CONTINGENCY FUEL. FLOW CONTROL MAY BE ADJUSTED SUBJECT TO SITUATION AND DISCRETION OF MUSCAT ACC WATCH SUPERVISOR. 1. ROUTE SEGMENT BETWEEN MUSRU AND KIPOL ON ATS ROUTE N881 IS CLOSED. 2. ROUTE SEGMENT BETWEEN RASKI AND KIPOL ON ATS ROUTE N881 IS UNI-DIRECTIONAL WESTBOUND ONLY. 3. ALL TFC TRANSITING MUSCAT FIR VIA MESPO SHALL EXIT VIA RASKI. 4. RASKI IS NOT AVBL FOR ALL EASTBOUND TFC TRANSITING MUSCAT FIR FROM TONVO LALDO AND GOMTA. 5. PARAR IS NOT AVBL FOR TFC TRANSITING MUSCAT FIR DESTINED TO AIRPORTS WITHIN WSJC, VTBB, WMFC AND WIIF FIRS. 6. DENDA IS NOT AVBL FOR ALL TFC TRANSITING MUSCAT FIR AND DEPARTING FROM NORTHERN UAE AIRPORTS. TFC SHALL FILE VIA A791. 7. FL300 ONLY AVBL FOR TFC ENTERING MUSCAT FIR FROM DENDA AND TAPDO. 8. FL300 IS NOT AVBL FOR ALL TFC ENTERING MUSCAT FIR VIA RASKI AND PARAR. 9. FROM 1700 T0 0300 UTC TRANSITING THROUGH MUSCAT FIR BETWEEN MUMBAI FIR AND PAKISTAN AIRSPACE IS NOT PERMITTED. 10. FROM 1700 T0 0300 UTC TRANSITING THROUGH MUSCAT FIR BETWEEN TEHRAN FIR AND PAKISTAN AIRSPACE IS NOT PERMITTED. On Feb 26, Pakistan shot down two Indian military jets and captured a pilot in a major escalation between the two countries over disputed Kashmir. This came a day after India launched air strikes on militant bases across the border in Pakistan, which itself was a response to a deadly attack on Feb 14 when a militant killed more than 40 Indian troops in Kashmir. The captured pilot has since been returned to India, but tensions remain heightened between the two countries in wake of airstrikes by each side in areas in the border region. If you have further ops info to report, please do! Email us at blog@ops.group, or comment below.